Очень по-русски (Very Much Russian) is an audio podcast for intermediate and advanced Russian learners. Every episode is dedicated to the Russian slang, idioms and colloquial expressions that you won't find in your standard textbooks. If you are an upper-intermediate or advanced Russian learner, this is a place for you to boost your Russian to a completely new level. The audio is recorded at a normal conversational speed and can be downloaded for offline use. Today’s episode will teach you three Russian idioms: ходить по струнке, вить веревки, and души не чаять. Today we continue learning interesting Russian phrases. This episode will tell you about such expressions as “днём с огнём”, “после драки кулаками не машут” and “за что купил(а), за то и продаю”. 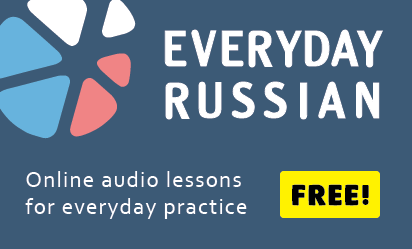 Today we continue to get acquainted with the conversational Russian language and learn four useful expressions that will help you sound more Russian. In this last episode of 2018 I introduce you to a few Russian expressions that can be used to describe moody people and the ones who is cheating on their partners. Russian humor – What do Russians laugh about? Today’s podcast is unusually long. It’s dedicated to the Russian humor. This time I’ll tell you about the humor that I grew up on and had the pleasure to observe during my life. The episode includes a lot of Russian jokes and anecdotes, as well as the links to the Russian comedies and comedy shows. Hope you enjoy it! This episode of Very Much Russian podcast is dedicated to greed and stinginess. You will learn the expression “жаба душит”, a Russian proverb about stinginess, and a few other useful words. This episode is entirely dedicated to the popular Russian expressions describing old things and people, namely: сто лет в обед, песок сыпется, анекдот с бородой. Hi everybody. In today’s episode we are looking at a few Russian expressions that you can hardly find in the dictionaries. Some of them are brought to us by a contemporary politician, others by a famous Soviet actress. All of them are quite funny and will definitely enrich your conversational Russian vocabulary. Hello everybody. Today’s episode of Very Much Russian podcast covers five informal and very informal Russian expressions. They are: с какого перепуга?, ежу понятно, терять совесть, каким макаром?, те же яйца, только в профиль.